Update: Pebble Core now comes with Alexa integration, allowing you to chat to the tiny wearable and get it to undertake tasks. When you hear the name Pebble you'll usually be imagining an e-ink smartwatch with a mega-long battery life and compatibility with iOS and Android. 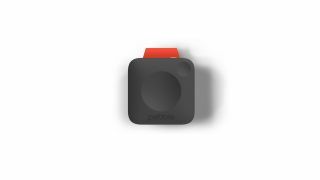 However, with the new Pebble Core there's no watch in sight… In fact, there's not even a screen. That's because the Core is a standalone device that's designed to let runners shed the phone and just run with a small wearable clipped about their person - and for a pretty cheap price too. So is this the ultimate runners' wearable, giving accurate location data and access to millions of tracks? Or is it another false dawn where too much functionality has been stripped out to hit a certain price point? The Core comes in at 40x40mm in size, and 20mm in depth. It's light at 50g too, and the whole thing is constructed out of polycarbonate and rubber. It's designed to be clipped onto a bag or clothing, or connected to a chain to be dangled around - or allow it recover lost bags or keys. Let's get right to it - what would make you buy this Pebble device over a dedicated running watch… Or even just using your phone? Well, the three key selling points are an inbuilt 3G modem, GPS tracking and the ability to play Spotify music on the go - which is pretty impressive, as that's something a number of brands have been trying to do for years, so what's Pebble managed that others haven't? The 3G connection (or you can use Wi-Fi too) is a nifty feature to have because it brings a new featureset to an otherwise dumb device. You can use this to send an emergency text message to a friend on the go if you're having an issue, or use the single button option to set up a dedicated command - ordering an Uber, for instance. However, there are some question marks hanging here: what happens if you accidentally sit on the button when out of range of a phone and an Uber turns up? Also, having to pay for a separate 3G connection through another SIM card is a hassle, especially when so few countries support multiple SIMs on the same account. Spotify integration is the big one here though - access to all your tunes on the go, and with 4GB of inbuilt storage you're able to play music locally or stream it on the go, depending on your preference. While unconfirmed, it's almost certain the Core will transfer playlists from your phone to the device at your request, with offline syncing allowed (meaning you won't need to use data). Pebble's CEO Eric Migicovsky told us that the partnership with Spotify came about as the brand simply used Pebble smartwatches and wanted to do something with the smartwatch brand - it remains to be seen whether this will be used in watches too. And when it comes to tracking, that's where things are really clear: it's got GPS tracking, and without music the Pebble Core will last for 20 hours before needing a charge (9 hours with internal playback and 4 hours if you're streaming over Spotify). The Pebble Core can therefore track you easily wherever you are (again, how will you know when you've got a GPS connection? Running watches can bleep to let you know they've acquired a fix, but what will need to be done here?) and then share that data with a variety of services. These currently are: Google Fit, Strava, Under Armour Record, Runtastic and MapMyRun. Presumably you'll be able to download your GPS files to use on other platform as well - but that remains to be seen. You can also record voice notes too - great for both inspiration striking mid run, or if you're trapped somewhere and need to record some last words. The latest change sees it connect up with Amazon's Alexa voice recognition tech, allowing you to press a single button and access the arsenal of voice commands available from the online retailer. Although the exact details of how this will work are a little sketchy (will it be over 3G, or will it need an Echo nearby? ), when connected you'll be able to ask it to order pizza, give you news headlines, review your Pebble Health performance, get weather information or control your smart home. These capabilities will be baked right in from launch too, so the Core now offers more bang for the same buck. Intriguingly, Pebble has decided to use a form of the Android OS on the Pebble Core, as well as packing in Wi-Fi connectivity (both things not seen on the Pebble 2 and Pebble Time 2. It's unlikely this heralds the start of the brand dropping its own OS and moving to a version of Android - after all, Google's wrist-based OS isn't designed to cater for e-ink displays - it's likely that means it'll enjoy an easier connection to certain phones and more support contained within, plus the ability to interact with Wi-Fi. If you're looking to get your hands on the new Pebble Core, you can pre-order from Kickstarter now, although at the time of writing it seems that all the early bird devices are sold out. That means you can get them for the $69 (around £45 / AU$95) price point, and the $79 (around £53 / AU$110) options will be quickly snapped up as well. When it hits retail, the Pebble Core price will be set at $99 (around £65 / AU$135) - and give the shipping date for backers is set for January it's fair to assume that's when it'll be coming to a shop - virtually - near you. Is the Pebble Core any good for running? It's all very well chatting about the specs and what it can do - but does it have the necessary elements to be a successful running device? There are instantly multiple questions, many of which have been asked here: will it simply dumbly track you, or can you set up interval-based updates to keep you on the straight and narrow? One of the key elements of phones and dedicated running watches is the ability to set targets, monitor your progress as you trot and work out whether you want to take that next right turn or head back home. What would be interesting is if this connected to your Pebble 2 or Time 2, taking the heart rate from that but wirelessly pumping over GPS data that could make the long-lasting smartwatch an interesting proposition indeed. After all, Pebble Time uses the same display as Garmin's running watches, so it could easily have a very legible display - and given the Pebble Core clips onto shorts or hangs off a bag easily, as well as streaming Spotify, this could be a very decent combo indeed. We'll be quizzing Pebble on a few of these questions in the coming days - check back if you want to find the proper low down on the new Pebble wearable!